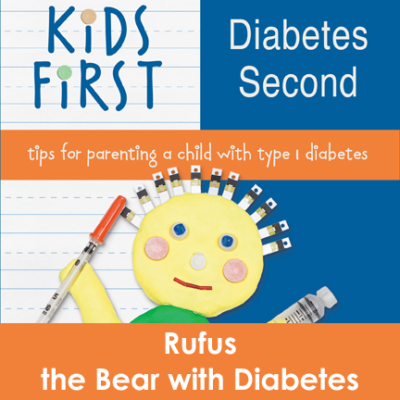 Summary: After all these years, Rufus the Bear with Diabetes still holds a special place in Q’s heart. Though other stuffed animals from her younger days have been boxed up, Rufus still has a place on her shelf. Rufus and the book which tells his story helped us get through a really tough week when Q had had enough and didn’t want injections. At the end of this excerpt is a little advice about giving choices. I am not saying that it was all sunshine and roses in those first few months. Our child was three years old after all, which presents its own set of challenges. Sometimes her appetite was bigger than expected, so we had to give her injections after a meal. Though she was initially compliant to getting her blood sugar checked and receiving four injections a day, there came a time that summer when she decided that she had had enough, and there was absolutely no way I was going to give her another shot. For about a week, I had a struggle on my hands. Some days, I had to leave work to give her an injection if she wouldn’t let my mom do it. I didn’t want to hold her down and force her, but she needed these injections to live. I didn’t want her injections to be dramatic and traumatic, but nothing I could say would stop her crying, screaming, and kicking as I came toward her with needle in hand. Luckily, a package arrived in the mail that week that contained the Bag of Hope we had requested from the Juvenile Diabetes Research Foundation (JDRF). Inside was a little bear named Rufus and a book. I read her the story. I let her check Rufus’s blood sugar and give him an injection. And then she let me give her hers. It was serendipity that he arrived right when we needed a way to get past this obstacle, and I’ll always be thankful for that. A bit of advice that we were given by one of the nurses in the hospital about caring for a young child with diabetes is to give a choice where there is a choice to be given, but that not taking care of diabetes is never a choice. In other words, ask your child which finger he or she would like to use for a blood glucose check. But checking the blood sugar is not a choice, it’s a given. Ask them where they would like the injection this time. But getting the injection is not a choice, it’s a given. And if a bandage makes a child feel better after a blood sugar check or shot, offer a choice of those, too. Diabetes is a fact of your child’s life now. Your child may feel that control has been taken away, so it’s important to give children some choices to make them feel like they still have some independence and say-so. When our daughter was diagnosed, we were told by the nurses to contact the JDRF for a teddy bear. At the time I was thinking that it would have been even better had she been given a special present while actually in the hospital. As we settled in back home, I eventually e-mailed our state’s JDRF chapter to request our Bag of Hope. They mailed it with lightening speed and I think we received it two days later. Q had been pretty compliant about finger checks and injections up until that point. But all of a sudden, about a month out from diagnosis, she decided she just was not having it any more. Injections were accompanied by screaming and tears and threats from me that she could do it the easy way or the hard way. I had to demand that she could sit still or I could hold her down because the only choice was to make it quick or drag it out. But there was no choice whether or not to get an injection. This rebellion made for a difficult few days. I don’t blame her. She was four and had every right to be fed up. But I didn’t know what to do to get over this hump. And then Rufus arrived, as if summoned by her D-Fairy God Mother. We read the book about the little boy who was diagnosed with diabetes and his special bear. And then we practiced checking Rufus’ finger and giving him an injection. No more struggles. No more tears. No more screaming. No more trying to get away from the needle that was coming toward her. She still plays with Rufus, occasionally wanting to do his finger check or give him an injection. She doctors him up when he is feeling sick. She’s repaired broken limbs and covered him in countless Band-Aids. 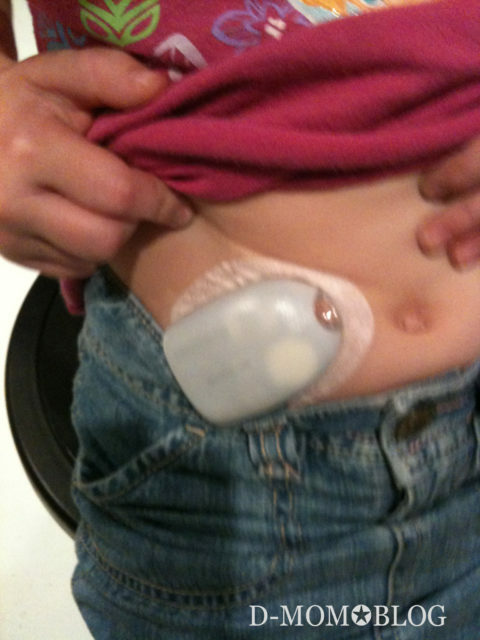 And when we were thinking about starting an insulin pump, she hooked Rufus up with one, too. 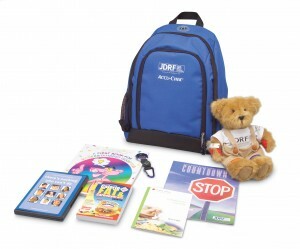 So if your child is newly diagnosed or you know someone who is, encourage them to contact their JDRF chapter and request the Bag of Hope. It really can help. If your child has been recently diagnosed, visit my Newly Diagnosed page for more resources. 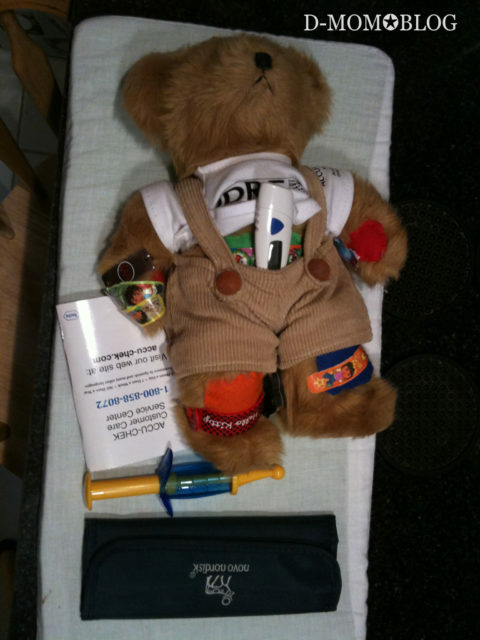 Read more posts about the Bag of Hope and Rufus the Bear with Diabetes. We have been thinking about getting an insulin pump for our daughter for a few months. When you make a decision, the process is not instant. You have to jump through hoops and wait for appointments. We are not at the finish line (or even the starting line as the case may be), but this week we moved one step closer to diabetes management that will hopefully increase her freedom and benefit her overall health. What amazes me about our daughter is her spirit. Spirit which you would think would be dampened by diabetes. When she was first diagnosed and we were sent to St. Louis Children’s Hospital for several days, she had a great time. Yes, the IV sucked. The finger pricks sucked. The injections sucked. But she had fun. In some ways it felt like a vacation for her (which is why we always try to pack some fun into our trips to see the endocrinologist). While we were in education sessions learning what we had to do to keep our child alive, she got to play in the playroom where staff indulged her with endless art projects and games. She came home with a huge stack of paintings. She hung out on the rooftop garden that overlooks Forest Park. She charmed every nurse and doctor. She became a fixture at the nurses station. They even gave her a real stethoscope. By the end of our stay, everyone knew her name and greeted her in the hallways. She told each and every person that her brother’s first birthday was approaching in a couple of weeks. Told of our monkey theme. Drew pictures of monkeys to show them. She had every right to be self-centered in those days, but instead she was focused on her brother’s upcoming big day. And she chose to have fun, as much as she could. When we were discharged, she asked if she could stay a few more days. But my husband and I were eager to return home. But not before a quick trip to the adjacent zoo. This past week I was reminded of how remarkable she is when it comes to her medical condition when we were summoned from the waiting room to follow the nurses to the conference room to begin our appointment. I had to hold back the tears as I thought at once how wonderful she is and how it’s not fair that at five sentences like these have to come out of her mouth. We headed up the elevators by the purple columns (if you’ve been there, you know which ones) and began our short class on how to use the OmniPod during our week long trial. Her first real OmniPod which delivers only saline during this trial week. We have to do double duty using the pump as if it was delivering insulin and doing our normal routine of daily multiple injections (DMI). 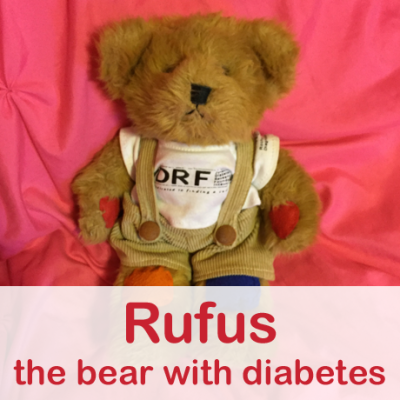 Here’s Rufus the diabetic bear* (I’m not making that up). She gave him his own pump (the thermometer), checked his blood sugar, gave an injection, and wrote all the info in his logbook. *Newly diagnosed children can contact their local/state chapter of the JDRF for a Bag of Hope if they did not receive one in the hospital. Rufus got us through a tough time a few weeks after diagnosis when she decided that she didn’t want injections any more.